There is ample evidence that news reporting is often biased and that such bias has a causal effect of voting (Puglisi and Snyder 2016). The issue has become even more prominent after the controversy over the role of ‘fake news’ in the 2016 US presidential election (Alcott and Gentzkow 2016). A powerful defence against biased or fake news is real unbiased news. We are less likely to be affected by false and skewed reports if we receive unbiased political information from reliable sources. But how many of us do? Is it the case that some of us access a lot of high-quality news while others are information-poor? It is crucial to distinguish between media production and consumption. In Western democracies, the truth is out there. A number of sources produce high-quality political information and make it available on the internet at zero or low cost. However, is this information actually consumed? In other words, where do people get their news? We have tried to answer this question in two recent papers. Prat (forthcoming) focuses on the US, while Kennedy and Prat (2017) covers 18 countries (all large EU countries, plus Brazil, Turkey, Japan, Australia, and the US). For the US, our data come from Pew (phone interviews), Reuters (online questionnaires), and the Simmons National Consumption Survey (a commercial consumption survey not focused on news), and for the other 17 countries they come from Reuters. It is surprisingly difficult to obtain useful evidence in this area. Almost all news consumption datasets are platform-centric, meaning they only cover one particular platform, such as Nielsen television ratings, newspaper circulation information, or a number of internet usage surveys. Data like this provide a highly incomplete picture, as the following example illustrates. Suppose we learn from one dataset that 50% of the population get their news from television, and we learn from another dataset that 50% read a newspaper. If we cannot merge the two datasets, this information is consistent with a situation where every citizen has one source of information, but also with a situation where half of the population is completely uninformed. Our work instead exploits person-centric datasets. For a random sample of citizens, we aim to learn about all the news sources they use, including traditional platforms like newspapers and television as well as every form of new media (online versions of old platforms, pure internet sources, news aggregators, social media such as Facebook, etc.). News consumption appears to be highly unequal. In our 18-country sample, the average number of sources respondents access is increasing in their income and education level. All else equal, the average college-educated respondent in the top third of the income distribution consumes two more sources than the average high-school graduate in the bottom third of the income distribution. The information inequality pattern observed in the individual-level data is mirrored by a similar pattern at the country level. 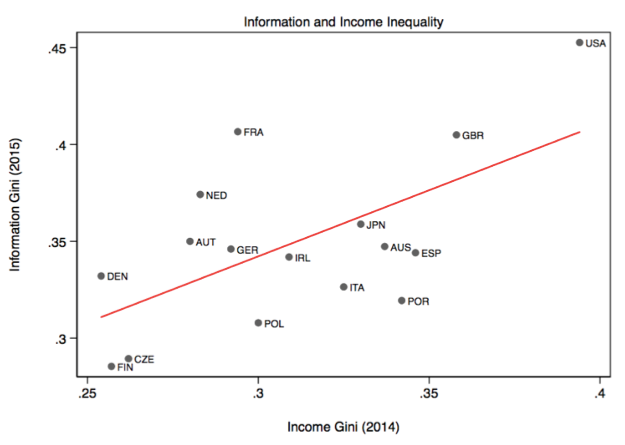 Figure 1 plots information inequality and income inequality – both defined as Gini coefficients, one on income, the other on number of sources – for the 16 high-income countries in our sample. The positive correlation between these two kinds of inequality is evident. The two countries where the debate on news manipulation is most salient – the US in reference to the Trump election and Britain with respect to the Brexit vote – are outliers in the top-right of the plot. This evidence resonates with the Petrova’s (2008) prediction that media capture is more likely in countries with higher income inequality. Note: Figure excludes Brazil and Turkey. The presence of large swathes of the population with highly concentrated news consumption means that the news organisations that cater to them are potentially highly influential. One rough way of measuring the power of a specific news source is to compute its attention share, which in its simplest form is defined as the share of citizens that get news from that source divided by the total number of sources they use. Thus, a source with a large attention share must have a large number of users, and those users most not follow many other sources. Table 1 displays the 15 US news organisations with the largest attention shares. A news organization is defined as a set of jointly owned news sources. 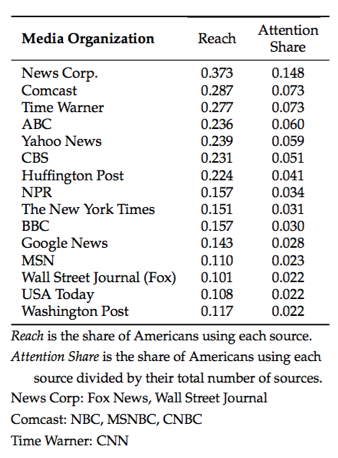 By this measure, Rupert Murdoch is the most powerful US news owner, both because Fox News has a large viewership and its viewers are information-poor: they access a smaller number of other sources then users of most other sources. This observation explains why the most powerful commercial news organisations in the world tend to be television companies. A rough measure of the media power of a news organisation is its ability to swing x% of the votes in a national election if y% of its users are completely naive and will believe anything it says. 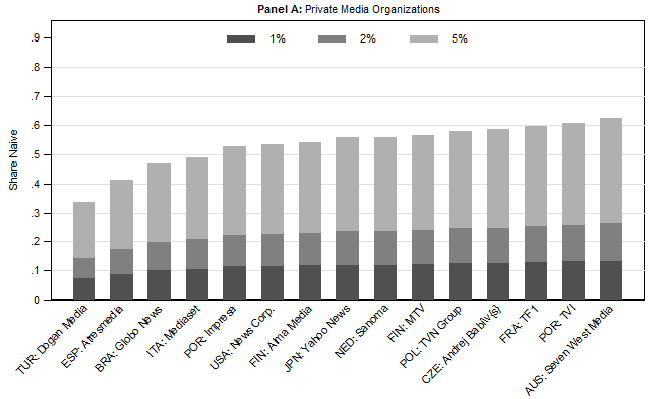 Figure 2 ranks commercial news organisations around the world based on media power. The vertical axis depicts the percentage of users of that organisation that must be naive for the organization to be able to swing 1% of the votes (e.g. turn a 49% loss into a 51% win), 2% of the votes, or 5% of the votes. According to the figure, the presence of even a relatively small minority of naive voters is sufficient for those media organisations to swing election outcomes. While online news sources are increasingly important, the world’s most powerful news organisations are still predominantly television-based.1 Obviously, the data cannot tell us whether media companies would actually want to exercise that power to manipulate the democratic process, but media regulators around the world should certainly be concerned by the possibility. Given the continued importance of television, what is the role of direct public news provision? Of the 18 countries in the sample, 16 have a large public service broadcaster. In Germany, Italy, the UK, and other smaller countries, the most powerful news organisation is government-controlled. Does public service broadcasting reduce information inequality? Unfortunately, our data indicate that public broadcasters do not particularly cater to the information-poor. People who watch state television are, on average, wealthier and more educated than people who use the largest commercial news provider. In conclusion, the available evidence indicates that information inequality plays an important role in determining the vulnerability of certain segments of voters to news manipulation. In turn, this makes a certain set of large news organisations particularly powerful. Future research should explore the possibility that this creates a vicious circle, whereby information inequality generates media capture, thus protecting the political interests of elites and maintaining income inequality, which in turn perpetuates information inequality. Alcott, H and M gentzkow (2017), “Social Media and Fake News in the 2016 Election,” Journal of Economic Perspectives 31(2). Kennedy, P and A Prat (2017), “Where Do People Get their News?” CEPR Discussion Paper 12426. Petrova, M (2008), “Inequality and Media Capture,” Journal of Public Economics. Prat, A (forthcoming), “Media Power”, Journal of Political Economy. Puglis, R and J M Snyder (2016), “Empirical Studies of Media Bias,” in S P Anderson, D Stromberg, and J Waldfogel, Handbook of Media Economics, Volume 1B, Amsterdam: Elsevier, North-Holland, pp. 647-667. As the Reuters survey is conducted online, the results are, if anything, biased against old platforms.